Yes we've been parking lots in parking-lots...and pouring lots of beer in these here lots. Dang, it that ain't a lotta lots. Well, I'm guessin' I should hush up with all these lots now. Well here's the first parking lot we parked and poured at this weekend; The Mighty Griffin Gastropub in Bracebridge, ON. Last Friday, August 2nd along side our good friends from Beaus's Brewery, we plopped down our kegs and poured for the Midnight Madness Parking Lot Party...and why yes, if it wasn't just pure madness! The lot was packed all night long with shoppers, party-ers and fun seekers alike. The boys at the Griffin, now they've been running this here event for 4 years or so now and each year it proves to be a hoot. We're certainly much obliged for their hospitality and look forward to many more such parking lot parties in the future. Unfortunately t'wernt no overnight parkin' at the Griffin so we had to pack up our belongings and make way to Kahshe Lake for the 30th Annual Kahshe Lake Craft Show and Sale. A little less asphalt and a lot more grass, this here lovely parking lot turned out to be right on the shores of beautiful Kahshe Lake. Now I ain't sayin' the Griffin ain't real purdy, but dang if this place don't just beat all! Surrounded by tall pines and sitting right on the heels of the historic Rockhaven Inn, the setting for the Kahshe Lake Craft Show was down right gorgeous, if I don't mind sayin' so myself. The weather may have been a little gloomy, but heck, it didn't stop the determined folk of Kahshe Lake from comin' on out to see the crafts and try some beer! There was a steady line of people all day and shoot if I didn't have some down right decent conversations with many of them. Good folks they were on Kahshe Lake. And with food, music, crafts and well...craft beer, there was certainly enough to keep everyone busy! If you ain't never ventured down to the Kahshe Lake Craft Show and Sale, I do highly recommend it! 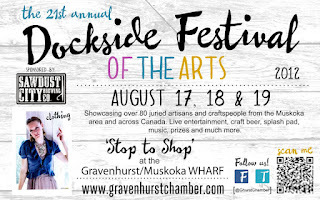 That was it for this weekend, but coming up in just two short weeks, yer gonna find us parked down at the Special Events Field on the Muskoka Wharf pourin' beer for the 21st Annual Dockside Festival of the Arts. Well shoot, now don't that look just look real darn snappy to you? 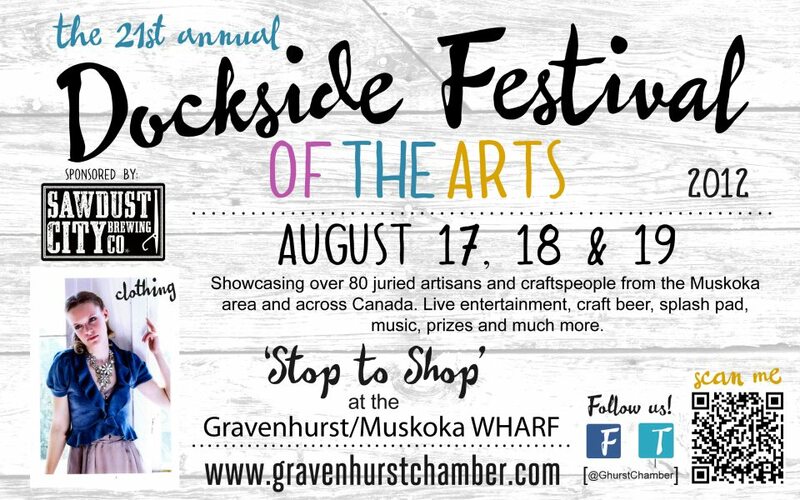 Well, if it do, I suggest you come on down to the Muskoka Wharf from August 17 to 19 and see fer yer self. Now like I said, we done gonna be there for 3 full days doin' our Sawdust thang, but then we gotta be hittin' the road cause we got another park to be parkin' and pourin' at. This time, it's Annie Williams Park right on the shores of the Mighy Muskoka River in downtown Bracebridge for the 4th Annual Muskoka Beer Fest. The boys from the Griffin are puttin' it on again and you just know Sawdust City is gonna be there pourin' beer and havin' a grand ol' time. And you know what? Looks like Lone Pine IPA might just make the trip with us! Now, it ain't gonna be quite ready for draught, but we know we gonna bring a fresh cask of dry-hopped goodness with us. Stuffed right to the hilt with Chinook, Simcoe and Columbus hops, the Lone Pine ain't fer the faint of heart. Along side Lone Pine, looks like we gonna be bringin' some Gateway Kolsch, some Golden Beach Pale Wheat and maybe one or two more special brews for y'all to try. Now tell me you don't wanna go to that! We most certainly do. So if you find yer self wonderin' down by way of the Brickworks on September 9th, stop by our booth, say hello and try some Sawdust City, we love makin' new friends.